TS G.O.Ms.No.7 Date:02.02.2018:: Filling of (1224) vacant posts of Civil Assistant Surgeon Specialist, (14) vacant posts of Dental Assistant Surgeon, (42) vacant posts of Super Specialists in Telangana Vaidya Vidhana Parishad(TVVP) and (183) vacant posts of Medical Officers & Lecturers in the department of Ayush, Telangana, Hyderabad through Departmental Selection Committee. HM&FW Department - Recruitment - Filling of (1224) vacant posts of Civil Assistant Surgeon Specialist, (14) vacant posts of Dental Assistant Surgeon, (42) vacant posts of Super Specialists in Telangana Vaidya Vidhana Parishad(TVVP) and (183) vacant posts of Medical Officers & Lecturers in the department of Ayush, Telangana, Hyderabad through Departmental Selection Committee - Orders – Issued. O.Ms.No.66, Finance (HRM-VII) Department, dated.01.05.2017. O.Ms.No.181, Finance (HRM-II) Department, dated.11.12.2017. ORDER Government vide G.Os 1st and 2nd read above have accorded permission to fill vacancies of various categories in HM&FW Department including (1175) posts of Civil Assistant Surgeon Specialists, (91) posts of Civil Assistant Surgeon, (14) posts of Dental Civil Surgeon in Telangana Vaidya Vidhana Parishad(TVVP) and (183) posts of Medical Officers & Lecturers in the department of Ayush, Telangana, Hyderabad through direct recruitment by Telangana State Public Service Commission. In the reference 3rd read above, the HM&FW Department have obtained orders of the competent authority to with-draw recruitment in respect of the above vacant posts from the purview of the TSPSC and entrust the same to Departmental Selection Committee. The HM&FW Department and the Director of AYUSH, Hyderabad and the Commissioner, TVVP, Hyderabad shall take necessary action for filling the respective posts duly following the Rule of Reservation, the provisions of the Presidential Order and the provisions of the Service Rules applicable to the relevant posts. The department shall obtain specific orders of the competent authority on the composition of the Selection Committee, selection process and other issues related to the recruitment process as per the statutory provisions applicable duly following the rules of business. They shall adopt a transparent selection procedure for the purpose. The Secretary, Telangana State Public Service Commission, Hyderabad and the HM&FW Department shall take further necessary action accordingly. DSC to fill 1,463 Health posts in Telangana State: The State government has decided to fill 1,463 vacant posts in various health categories that fall under the Telangana Vaidya Vidhan Parishad (TVVP) through the Departmental Selection Committee (DSC) instead of the Telangana State Public Service Commission (TSPSC). According to Health Department officials, the decision comes in the wake of delay in initiating the process of recruitment for the vacant posts through the TSPSC. It was in May 2017 that the State government had given the green signal to fill the vacancies in various categories in Health, Medical and Family Welfare departments. In the last few months, thanks to various health initiatives, the number of patients visiting State-run health institutions has increased which has put a lot of pressure on the existing healthcare staff in the hospitals. Senior doctors said there was a dire need to recruit doctors in the vacant posts as early as possible. According to senior Health Department officials here, the vacant posts will be filled in the coming months through direct recruitment. There are close to 1,280 vacant posts in various categories falling under health institutions attached to the Telangana Vaidya Vidhan Parishad while the remaining 183 vacant posts mostly consist of medical officers and lecturers from the Department of AYUSH, Telangana State. The process of direct recruitment is expected to be completed in the coming few months, senior officials added. Civil Assistant Surgeon Specialists: Obstetrics and Gynaecology (149); Anaesthesia (176); Paediatrics (172); Radiology (79); General Medicine (75); General Surgery (107); Orthopaedic (61); Ophthalmology (37); ENT (18); Pathology (60); Psychiatry (29); Dermatology (23); Hospital Administration (24); Forensic Medicine (63); Pulmonary Medicine (60). Super Specialists: Urology (06); Nephrology (06); Cardiology (06); Gastroenterology (06); Medical Oncology (06); Neurosurgery (06). Civil Assistant Surgeon (91); Dental Assistant Surgeon (14). Lecturers: Homeo: (11); Ayurveda (12); Unani (8); Medical Officer: Homeo (36); Ayurveda (62); Unani (54). In the coming few months, the Commissioner of Health and Family Welfare and Mission Director of NHM will recruit the healthcare workers for various projects, which are being implemented in Hyderabad and across the State. Out of the 965 posts, 500 nurses will be recruited on contract or outsourcing basis for NHM’s Non-Communicable Diseases (NCD) project. Eight paediatricians and close to 28 staff nurses will be recruited to strengthen the Special Newborn Care Units (SNCU) projects in districts. The rest of the posts to be recruited comprise Auxiliary Nurse Midwife (ANM), accountants, data manager, epidemiologists, data assistants, lab technicians and pharmacists. G.O.Ms.No.198, Dated:22-12-2017 :: GOVERNMENT OF TELANGANA - Health, Medical & Family Welfare Department - Filling up of certain new posts in various programmes on Contract/Out sourcing basis under National Health Mission - Administrative sanction and permission to filling of posts - Orders - Issued. G.O.Ms.No.119 Dated:13.07.2017 :: GOVERNMENT OF TELANGANA -HM&FW DEPARTMENT – Creation of (251) posts in Director, MNJ Institute of Oncology & Regional Cancer Centre, (MNJIO&RCC) Hyderabad under the control of Health Medical & Family Welfare Department – Orders - Issued. 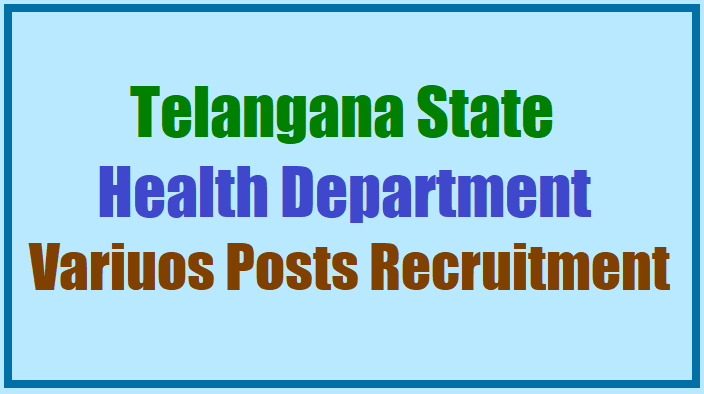 TSPSC to fill 2118 Various posts in Health, Medical & Family Welfare Department - GO.Ms.No.89,Dated:13.07.2016:Assistant Professors, Civil Assistant Surgeons, Staff Nurse, ANMs Posts recruitment-Govt of Telangana, Public Services - HM&FW Department - Recruitment - Filling of (2,118) two thousand one hundred and eighteen vacant posts in Health, Medical & Family Welfare Department through the Telangana State Public Service Commission, Hyderabad - Orders - Issued. TS Govt Order.102,Date:29.08.2016::Public Services - Health, Medical & Family Welfare Department - Recruitment – Filling of (21) Twenty one vacant posts in Telangana State Directorate of Institute of Preventive Medicine, Public Health Labs & Food (Health) Administration through the Telangana State Public Service Commission, Hyderabad - Orders - Issued. Ref: Health, Medical & Family Welfare Department U.O.No.4735/C2/2016 Dt.02.08.2016.